Издательство: te Neues, 2005 г.
Жанр: Культура и искусство на английском языке и др. 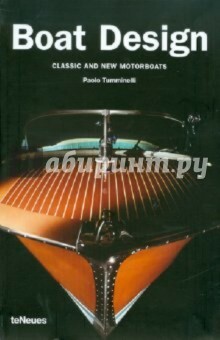 Аннотация к книге "Boat Design"
This history of Boat Design and culture since the beginning of the 20th century covers speedy mass-produced, motor-propelled motorboats and yachts. Design enthusiasts will find information on types, forms, materials and colors. The focus is on American and Italian models from the end of the Second World War through the present day. Top boat manufacturers and designers such as Christopher Columbus Smith, Carlo Riva and Sonny Levi feature prominently. This lavishly illustrated compendium contains many photographs sure to spur your own dreams of hitting the high seas, or dropping anchor in a secluded cove! Paolo Tumminelli is the founder of Goodbrands, a consulting firm for design, marketing and communications. A professor of design at the University of Applied Sciences in Cologne, he has written for Domus and is currently writing for the European design magazine Form and the Handelsblatt. In 2004 he edited Car Design for teNeues.